The first of Greater Anglia’s brand new Swiss trains has now arrived in East Anglia. The four-carriage bi-mode train, which will ultimately run on regional lines across the Greater Anglia network arrived on Thursday 15th November. It was hauled to Norwich by a class 66 locomotive and will now undergo a programme of testing around the network before it is passed as ready to go into service. Ian McConnell, Greater Anglia Franchising and Programmes Director said: “It’s so exciting to see one of our new trains here in East Anglia. I’m sure people will be impressed when they see it – it is very different to our existing trains. “People will be able to see for themselves that we really are transforming the railway in East Anglia. Technicians have already carried out a number of tests on the train in Europe including testing brakes, pantographs, noise levels, emissions, operational safety, automatic train protection systems and testing on special curved tracks against derailment. Now the train has to be tested on the Greater Anglia network to make sure it passes strict regulations for being safe to carry passengers in the UK. Over the next few months, a number of tests will take place, including testing the train’s pantograph, passenger information system and automatic selective door opening – for when the train is longer than a station platform. 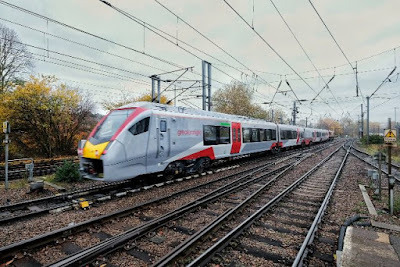 After a period of classroom-based training, which will include sessions on new multi-million pound simulators, Greater Anglia’s drivers will then be undertaking test runs using the new trains on routes across Norfolk, Suffolk and Cambridgeshire. 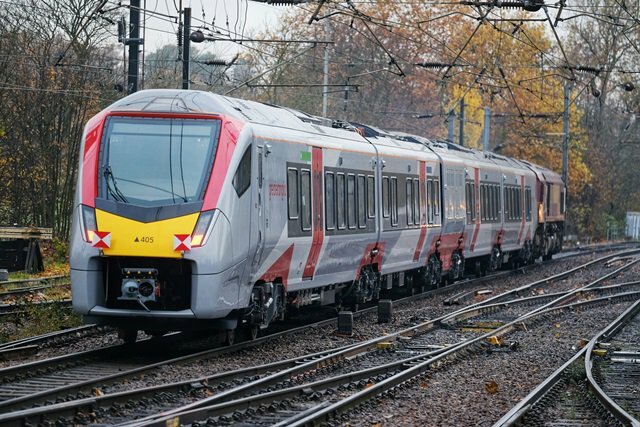 Greater Anglia is getting 38 bi-mode trains – 24 four-carriage and 14 three-carriage trains - which switch from diesel to electric power - from Swiss train manufacturer Stadler. They will run between Norwich and Cambridge, Sheringham, Lowestoft and Great Yarmouth; Ipswich and Cambridge, Lowestoft, Felixstowe and Peterborough; and Marks Tey and Sudbury. The company is getting ten Intercity and ten Stansted Express trains from Stadler. It is getting a further 111 electric trains from Bombardier, in Derby, to run on commuter routes into London Liverpool Street from Essex, Ipswich, Cambridgeshire and Hertfordshire. All of the trains will have plug and USB sockets, fast free wifi, air conditioning, accessible toilets, wheelchair spaces and bicycle spaces. They should all be in service by the end of 2020. “The arrival of the first Greater Anglia train on British soil is a highly symbolic moment, both for the project and for the Stadler business. We’ve made no secret of the fact that we are keen to make headway in the UK market. This order placed two years ago was our first major contract for passenger trains, paving the way for subsequent orders with Strathclyde Partnership for Transport, Merseytravel, and most recently, for Wales & Borders.